More in Week 2 of high school playoffs. Schurr High School will have a long bus ride Friday as the top-seeded Spartans travel to Santa Maria for a CIF Southern Section Division 12 quarterfinal. The 10-1 Spartans rolled to their seventh straight victory by overwhelming Santa Ana Valley, 49-14 in the first round. Schurr built a 28-0 halftime lead and cruised to the win. Santa Maria (7-4) was as equally impressive in its first round victory as the Northern League champion Saints defeated Carpinteria, 49-28 for their fifth straight win. 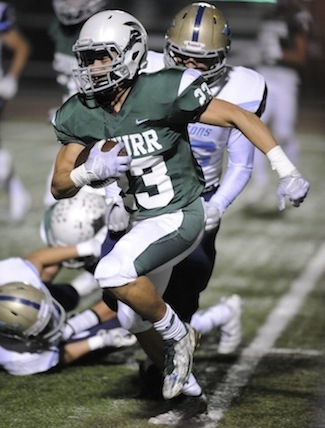 Schurr amassed 537 yards of total offense in its victory over Santa Ana Valley last Friday with quarterback Miguel Aguero and running back Kevin Lopez accounting for most of it. Aguero passed for 362 yards and four touchdowns as the senior completed 23 of 29 passes. Lopez rushed for 160 yards, including three touchdowns, on only 14 carries. Francisco Remigio caught three touchdown passes and finished the game with seven receptions for 130 yards. Sebastian Ramos and Aaron Silva each had six receptions for 95 and 81 yards, respectively. Lance Babb caught three passes for 53 yards, including a touchdown reception. Linebackers Adam Handy and Aaron Rosales led Schurr defensively. Handy had 12 total tackles and Rosales was next with 11. They led a relentless Spartan pass rush that recorded 12 sacks. End Isaiah Cruz was credited with 4.5 sacks and Rosales had three. Angel Rodriguez, who had eight tackles, had 1.5 sacks. Montebello advanced to the quarterfinals in the Division 10 brackets after going on the road to defeat Pasadena Poly, 28-24 in the first round. The Oilers (7-4) will have their hands full Friday night when they play No. 1 seed Apple Valley at Montebello. The undefeated Sun Devils (11-0) destroyed Twentynine Palms, 75-0 in the first round. In the City Section quarterfinals, Garfield plays El Camino Real in a Division I quarterfinal Friday night at Garfield that is a matchup of teams with identical 6-5 records. Garfield, the fourth seed, defeated Taft 43-7, while fifth seeded El Camino Real beat Hamilton, 30-18 in their first round games. Eagle Rock (10-1), the No. 1 seed in Division II, plays South East (4-7) at home Friday. The Eagles defeated Hollywood, 50-13 in the first round for their seventh straight win. South East advances after beating View Park, 28-20. Roosevelt will square off against Eastern League rival Huntington Park Friday at H.P. The Rough Riders defeated the Spartans, 28-18 when the teams met two weeks ago to finish league play. Roosevelt (6-5), the No. 7 seed, edged Washington, 22-20 in the first round. Second seed Huntington Park (8-3) beat Belmont, 40-8. In Division III, Torres (7-4) plays Verdugo Hills (6-5) at home. The Toros beat Jordan, 34-6 last Friday behind another outstanding game by Tiquan Gilmore, who rushed for 214 yards, including three touchdowns on only 10 carries. Andrew Morales also had a big night with 122 yards on 15 attempts. Sixth seed Wilson (6-5) will play at third seed Locke (9-2). The Mules defeated Poly, 28-14 in the first round. November 16, 2017 Copyright © 2012 Eastern Group Publications, Inc.